New York: Double Honor Killing Of Muslim Sisters? These two sisters wanted to be free. They worked hard to stay alive – they lived in various shelters and had applied for asylum – fearing persecution for religious or political beliefs. 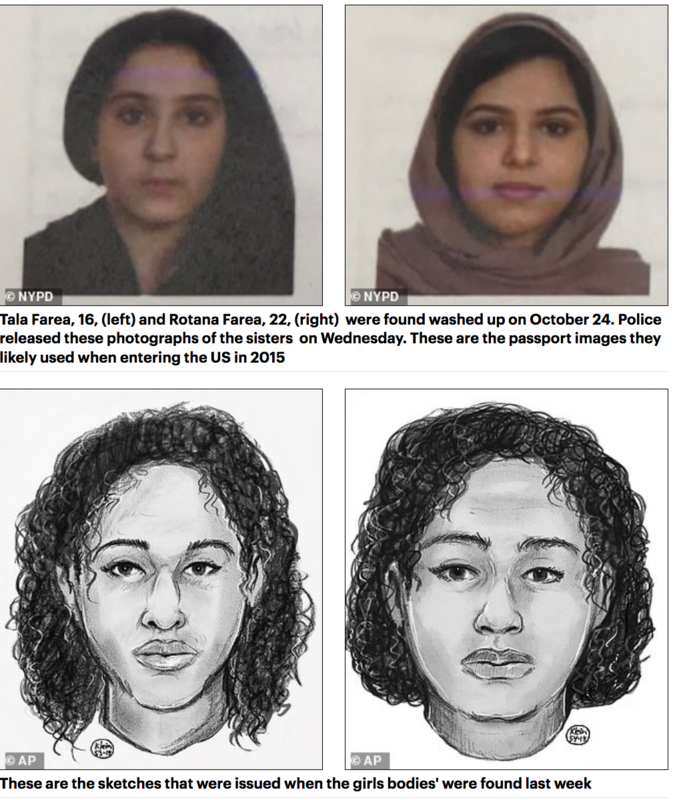 ‘They were a happy family,’ says relative of Saudi sisters found dead in New York – then why did they keep running away? The Embassy reportedly told her that her family’s residency in the U.S. was in jeopardy because Rotana and Tala applied for immigration asylum. Believe nothing the family says. They said the family was happy with Tala living with her sister who she missed dearl when she left Virginia. Police have ruled out that the pair jumped from the George Washington Bridge in a suicide pact, a theory that was initially pushed out by police, because neither body had visible signs of trauma. It is not known how long they were dead before they were found but police struggled to identify them for days. Rotana dropped out of George Mason in May this year after two years of studies. George Mason, a public university with 35,000 students has close ties to Saudi Arabia. The Saudi Arabia Cultural Mission has gifted the college $63 million and has paid for the education of 270 of its 370 Saudi students. Rather than live on campus like many of her classmates, Rotana traveled back to her home in Falls Church, Virginia where she lived with her mother, brother and Tala. Rotana attended classes at the Volgenau School of Engineering and sources say she planned to major in bio-engineering when she returned this fall. But the University told DailyMail.com that Rotana never returned in August to complete her education. Problems arose for Rotana when she learned her whole family would have to return to Jeddah, Saudi Arabia. A source at the Saudi Arabian Embassy in Washington, DC told DailyMail.com Rotana’s sister Tala had won a full scholarship to study at Dar Al-Fikr, a top private school in Jeddah. Tala had briefly studied in 2017 at Fairfax High School, close to George Mason University. Rotana and Tala’s mother contacted The National Center for Missing and Exploited Children on August 24 after Tala went missing from home. She then called off the search after learning Tala was with Rotana in New York. She also told authorities the pair were applying for asylum in the US to avoid returning to Jeddah. Family members told Arab News that the two sisters had only lost contact with their mother a week ago. They are insisting that the pair did not commit suicide and are waiting to find out the cause of death from the Chief Medical Examiner, which has not yet released findings from the autopsies.